A dear cousin gave Jake this beautiful piece of art when he was born. We promptly hung it in his room. Fast forward 4 years to this St. Patrick’s Day craft we were doing. Jake spent a lot of time working on his project, putting the colors in rainbow order. He would add a few dots in different spots “for creativity”, and I was cool with that. At first I was very upset. His picture looked so good and now he had ruined it. (Shamefully, in the back of my mind I was thinking “ugggh, I was planning to post this picture on the blog!”) I started to yell at him, then I looked at his face. Full of wide-eyed innocence he said “I was seeing what happens when I mixed it all up” with such pride in his voice. After all, we do LOVE the book Mix It Up! This simple project meant as a holiday decoration reminded me of all of the the things I want for my son. I want him to take risks and be unafraid of failure. I want him to to express his creativity and individuality without pressure to conform. I want him to think outside the box without repercussion. I want him to be spontaneous and have fun without holding back. I want him to try new things without the constraints of perfectionism. I want him to act with passion not restriction. In the end, it was a lesson learned for all. He gained valuable art, science, fine motor, and personal growth experience, and I learned to let go of preconceived notions and just let him be. Life doesn’t have to fit neatly between the lines. Color it any way you want! P.S. I still despise paint and did not enjoy the mess, but it is so very worth it. All of these wonderful St. Patrick’s Day ideas have put nutritious food in our bodies, creative activities in our hands, and a big dent in the Stroller Savvy Pin Challenge! Not bad for a non-Irish lass! 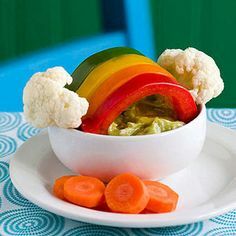 We have truly been eating the rainbow and feeling great! Consider this tasty detox soup I made last night. It was by far the tastiest I have had, and I would have been pleased receiving it from a restaurant. Tomatoes, red onion, carrots, garlic, ginger, lemon juice, kale, broccoli, celery, and purple cabbage along with many antioxidant-rich spices. Keeper? Yes! I doubled the recipe and froze some for later! Sure to impress, this simple yet fancy looking egg-in-a-pepper dish adds a fresh twist on your ordinary fried egg. It was far easier than I expected and tasted great! An Ol’ Irish favorite with a healthy twist. This low-fat, veggie-packed Shepherd’s Pie is topped with a cauliflower puree! The whole family loved it and the coconut oil added a nice flavor. This fabulous salad can be adapted to use any ingredients you desire. I used red beets, shredded carrots, yellow tomatoes/garbanzo beans (I intended to use yellow peppers, but Hubby and Jake at them before I could), a mix of spinach, broccoli and kale, and purple cabbage. I didn’t follow the dressing recipe exactly. I didn’t use anchovies or capers, but my concoction of greek yogurt, dijon mustard, honey, garlic, seasoning mix, and olive oil was actually quite good on this. I love the use of red beets and purple cabbage since they aren’t foods I eat often, but they are so yummy and nutritious! Keeper? Absolutely! We threw some rotisserie chicken on the leftovers for another delicious meal. A healthy twist on green eggs, these garlic and kale filled eggs were so simple and quite tasty! My 4-year old and 18-month olds even agreed. Keeper? Definitely! This will become a regular rotation in our breakfast repertoire. This nutritious salad is an easy go-to meal anytime. The creamy avocado makes it dressing optional. Beware- the shrimp is spicy! Keeper? I will make some variation of it again, but I would most likely just grill the shrimp without all of the added spice and ingredients. It would certainly save time too! We made this simple, delicious snack. I didn’t get a picture before the kids attacked it, so this one is from the Family Fun magazine. I made my own version of guacamole, which is simply mashed up avocados, diced tomatoes, a little minced garlic, and a splash of lemon juice. Keeper? Absolutely! Can’t go wrong with veggies and guac! Keeper? Yes! My son loved it. I love these kinds of cheesy decorations to put a fun twist on the holiday and capture a memory of this point in time. Nor is any St. Patrick’s Day complete without Fruit Loops! Jake only gets to eat them when we stay at hotels with continental breakfast, so he was tormented all week looking at the box in the pantry. He was so excited that we invited some friends over to do Fruit Loop crafts with us! First we made the fruitloop necklackes. I recommend a large blunt tapestry needle to help thread the cereal on the string- especially for the younger children. This kept them all quiet and actively engaged for quite awhile! He later became a walking commerical. “I am hungry and don’t have time to go downstairs for a snack. I think I will take a bite out of my necklace, chomp chomp”. Keeper? Definitely! He has already made three! As he gets older he can work on creating interesting patterns. This was a simple, fun craft. The biggest challenge for me was cutting out shamrocks, because I am just that bad at drawing! I ended up tracing an image from the computer and cutting it out on construction paper. We cut up different patterns of scrapbook paper with varying shades of green, covered the shamrocks with glue sticks, and applied our “mosaic tiles”. Of course Jake added some TMNT stickers- they are green, right?! Keeper? Yes!!! Easy, cute, held interest. I even used them as a front door decoration in the middle of a wreath. This was another fun one. I cut out a pot from construction paper and drew lines on a piece of construction paper to help guide the shape. J and ROY G. BIV are on a first name basis by now. Keeper? Yes. It was cute and fun, but I REALLY despise paint. See why here. Oh the sacrifices we make for the sake of our children’s enrichment and entertainment! Keeper? Yes! I look forward to experimenting with all different types of materials- acorns, apples, leaves, etc. I love that all ages can enjoy it. As they get older, challenge kids to form more intricate designs. Jake also had a blast doing educational worksheets. I remember loving thematic worksheets as a kid- it is a “break” from the traditional learning and even though you are reinforcing the same skills it doesn’t feel like it. This counting one was a little too basic for him, but he still enjoyed it. It was fun for him to be able to do it completely unaided. He had a blast with this domino activity. He would pick a domino from a pile, tell me how many dots were on each side and then add them all together. I was impressed when he didn’t flinch at the higher sums! Keeper: Of course! I will always seek out thematic educational activities to meet their current academic level. He absolutely loved this craft. He put it together quickly and finished with an impromptu play about how clouds change for different types of weather. It was awesome. We will do a few more activities on St. Patrick’s day, but I wanted to make sure you had some ideas to prepare yourself for the holiday. Have a Pintastic time!